Extend your limits with the greater capacity of this solid and reliable heavy duty stapler. Powerfully staples up to 160 sheets of 20 lb. paper - for added project efficiency. Durable all-metal working components. Full 2-5/8" throat depth for flexibility and control. Soft-touch materials for stapling comfort. Uses Swingline series #353XX or #793XX heavy duty staples: 1/4", 3/8", 1/2", 3/4". 5 Stars Review by D.B. Purchased this to change a really old 10 pound steel stapler. Can't believe how well this thing works and how easy it is to use even with 100 plus pages. Target has the best price by far as well! It's very easy to use - does a great stapling job. It's versatile to the size job I have to staple. It's easy to change staples. It doesn't take up much space on my desk and I don't need to plug it in! Welcome to MyBinding video. This is the Deluxe Heavy Duty Stapler by Swingline. Built with durability and strength in mind, this stapler can punch up to 160 sheets of 20lb paper per punch. The table on the front helps you choose which staples to use and the mechanism is smooth and easy. It has a full two and five-eighths-inch throat depth, which delivers flexibility and control. In case of staple jams, the front-end jam clearing mechanism delivers easy maintenance. It holds a lot of staples and filling is a snap. Simply pull out the lever in the back, slide them in, and load it back up. That's it, that's the Deluxe Heavy Duty Stapler by Swingline. For more demos, reviews, and how-tos, check out MyBinding.com. 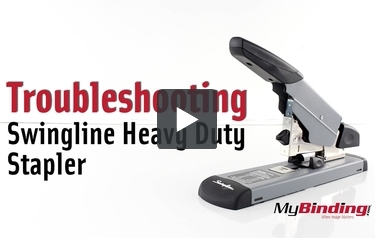 Transcript: The Swingline Heavy Duty Stapler is one of the most affordable you’ll ever find. That being said, it can be more troublesome—so now for some troubleshooting! It is fairly easy to jam. So if this happens push down on the front black tab and swing it open. Any troublesome staples should fall out. Make sure that the loading mechanism is in place so it pushes all the staples forward and out the stapler. 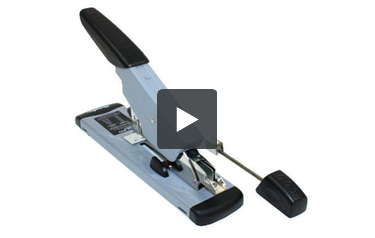 The Swingline Heavy Duty Stapler is one of the most affordable you’ll ever find. That being said, it can be more troublesome—so now for some troubleshooting! There have been questions on how to load staples. Well, push forward, up, and then bring the mechanism back to then be able to place in your staple strip. You’ll see how it basically just hooks in place. Then put your staples in and hook it back into place. To remove the staples, they should just slide out the back. If they do not however, you can load your strips in smaller pieces. That way you can open the front, and they’re just pop out. It’s not meant for it, but it is a work around. Next, make sure that you are using the correct size staple. You can see that I have a staple that is too large for this stack—it’s troublesome and unsightly. Always refer to the guide on the front for what size to use. To play it the safest, we recommend getting the swingline heavy duty staples that have a product number starting with #353**(and followed by two more numbers depending on the size). For best practice, you’ll see that when you bring the stapler down make sure it goes down all the way. There is a point where it needs more pressure to complete the stapling process. If you do it fast enough and hard enough this goes unnoticed in one clean motion. Our documentation for this stapler is limited. Your best resource is going to be contacting the manufacturers tech support group. Swingline's customer service phone # is 1-844-715-3692 .